Get the latest GlennArt Farm news (including updates on our Goat Yoga classes) by checking out our glog and our Facebook page! This spring GlennArt Farm will be collaborating with GrowthPlay Consultants in Chicago and The Happy Apple Pie Shop to create a fundraiser: Compost for a Cause (CFC). Beginning May 1, compost will be sold at GlennArt and Happy Apple to raise funds for hiring kids and young adults on the West Side to work on the farm. GlennArt Farm mentors and hires local youth from ages 11 through 23. We support them by providing a good work experience references as they grow up and get jobs outside the "hood." In addition, we actively encourage the young people we come in contact with to return to school if needed, and in getting academic assistance. The Happy Apple Shop's mission is to provide a work space for people with disabilities—and they sell delicious pies! It's good for your garden, too: Every week from spring until late fall, we compost our manure using the lasagna method. We layer grass clippings, manure, food waste, shredded paper and leaves and seal it with dirt. This is the first year that we have a large amount of seed-free compost aged 9 months and beyond. So beginning May 1 come and get your compost! Look for our bags at ​The Happy Apple Pie Shop (226 Harrison St, Oak Park) as well as at our own homestead at GlennArt Farm. 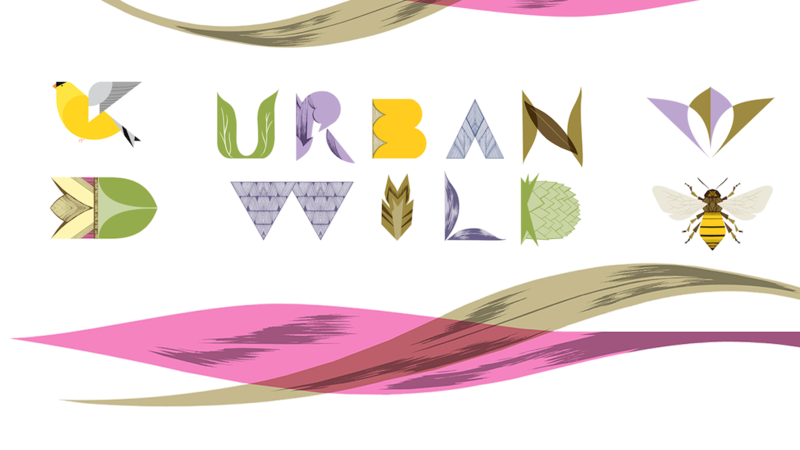 ​URBAN WILD: WE PLAYED THE PAVILION! We were honored to be the only dairy farm that Lurie Garden invited as a vendor to the Urban Wild event, which took place at the Jay Pritzger Pavilion in Chicago's Millennium Park on October 19. We arrived with a full complement of our delicious products, as well as scrumptious goods from our partner, The Happy Apple Pie Shop! The weather was perfect—sunny skies and mid-60s temperatures—as we enjoyed center stage of this beautiful bandshell. Urban Wild is Lurie Garden's celebration of one of their favorite seasons in the garden. Attendees were able to partake in the bounty of the garden and busy bees and the products from other wild and domesticated urban residents. Lurie Garden sold honey and gave away seeds. Guests came for the delectable samples and sales of food and other local products, and were invited for a tour of the fall garden to learn about how to support bees and other important invertebrates in their own gardens. This year, our fellow vendors were: Goose Island Beer Co., Chicago Honey Co-op, Bike a Bee, GoodandHonest Natural Soaps, University of Chicago Press, Closed Loop Farms, FedUp Ferments, Project Onward, Kathy Hoglund Photography,The Roof Crop, and Old Town School of Folk Music! Boogie with the Goats | Family Friendly & Free! The goats will be at the farm until the end of November, but now's your last chance of the year to mingle with the goats. With the addition of live blues music, you'll have a chance to boogie with the herd and the whole goat-loving and goat-curious community! 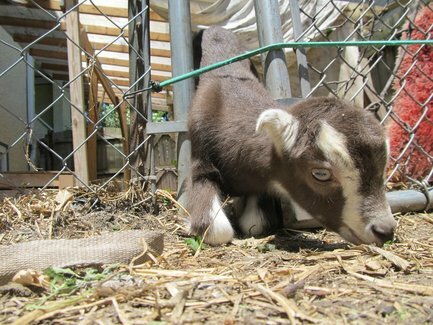 From 8 to 9am, watch the goat milking—or try your hand at it yourself—at GlennArt Farm (behind the house at 5749 W. Midway Park)​. We'll then walk the goats to the pasture, after which there will be a lull in the activity while we set up for the gathering. Here are the directions to the farm. From 11am to 2 pm, activity begins at GlennArt Pasture, one block east of the farm at 457 N. Waller. While "Barrelhouse Bonni" McKeown tickles the keyboard, we'll open the pasture gates for the last time this year, so everyone can spend face-time with Esther, Martha, Gracie, and the rest of the gang. There will be free hot lemonade for all, lots of our fresh farm products on sale— including raw, unpasteurized goat milk as well as cheese, yogurt, honey, and cajeta— and of course the camaraderie of those who love goats. Here are the directions to the pasture. Learn more about blues pianist, journalist, teaching artist, and citizen activist "Barrelhouse Bonni" McKeown. goat yoga class at GlennArt Farm. On June 10, GlennArt Farm hosted Goat-A-Palooza 2017: Udder Bliss—an all-day event that brought rare opportunities to the Austin neighborhood. The Milk Bucket Challenge was enjoyed by two families arriving at 8 a.m. The Martinez women, four of them, donned gloves and tried their hands at squeezing raw goat milk from our nannies. It seems the younger they start the faster they learn. Brooklyn and Sage especially hit the bucket. Ms. Irene came and fulfilled her desire to milk a goat, and proved to be a fast learner as well. Goat Yoga proved to be a very popular part of the day. Fresh from their success at recent Garfield Park yoga sessions, our herd joined over 33 yoga practitioners, bringing serenity and curiosity to each of the two sessions at Waller Pasture. 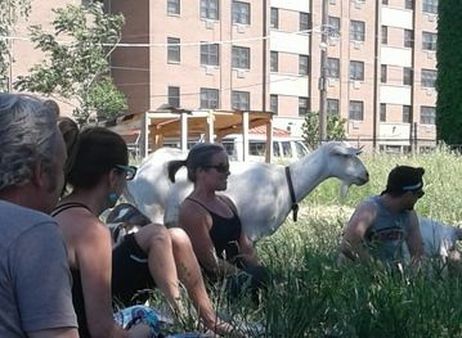 This was so successful that we've extended Goat Yoga for four more sessions (see above) and the goats will be at Garfield Park, browsing around the grounds and participating in more yoga later this month. Keep checking the Garfield Park events page for updates on what the goats are doing over there! 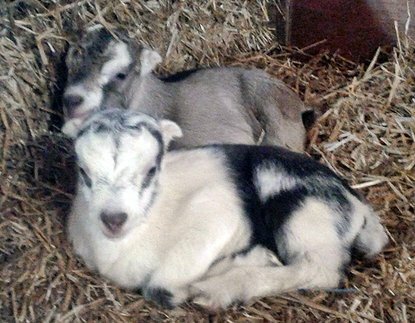 Goat baby-naming is complete! At the event we wrapped up the kid-naming with a lot of fabulous ideas—read more in the article below. The open pasture from 11 a.m. to 2 p.m. brought about 30 people to enjoy the peaceful place and opportunity to pet a goat. Goat dairy products were sold as well as Cynthia Borah's outstanding goat milk soap products. We continue to take orders for goat milk, yogurt, chevre and feta. THE KID COUNT IS COMPLETE! 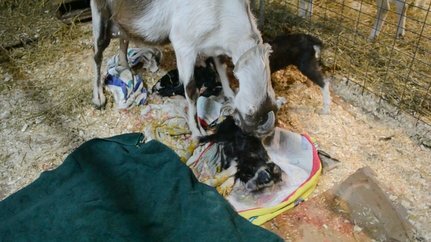 On April 27, Esther gave birth to quadruplets—a rare occurrence! Three girls and one boy have to share their mama's two teats, but they're getting on just fine. 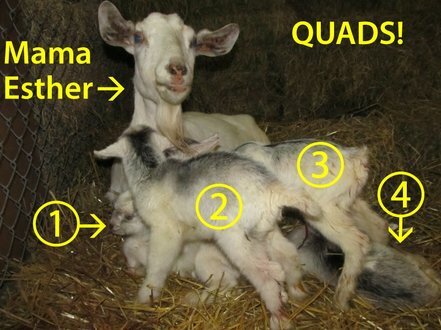 Then on May 4, Martha had triplets! Two boys and a girl—bringing the total to five boys and five girls. On May 17, Patsy gave birth to a little girl. Then four hours later, she gave birth to a boy. It was a long and rough delivery from which Patsy is still recovering, but the kids are healthy and are very creative sucklers, as sometimes they have to reach the teat while Mom is lying down. Ten days later, Destiny had a little kid. At first it seemed she rejected her baby, and we were bottle feeding the little critter. But later we discovered that the new baby was getting suckled somehow, so everything is jake. ​Watch the ​Glog, our Facebook page, and this space for more news about about the does and their kids. We're delighted that all the kids are sporting new names... now if they would just answer when they're called, everything would be perfect! Now you know their names, come and visit! Esther came through the birthing like a champ! Here she is with Duke, Luna, Gertrude, and Starry Night. First-time mom Gracie has two philosophers to take care of: Plato and Socrates. Destiny's Child (D.C. for short) is an adventurous explorer. 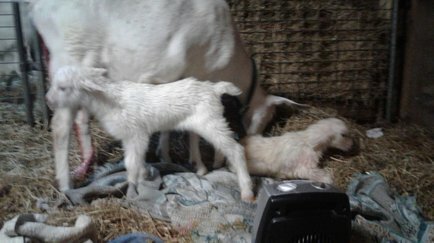 Here are Patsy's newborn twins, Oreo and Happy! Martha's triplets all have dark coloring—a first at the farm. These cuties are named Fidget, Spinner, and Millie. Check for updates on our Glog or on Facebook. Click/tap the Week tab or right on the event to get more specifics and/or to add the event to your own calendar. Use the blue arrow buttons to go from month to month or week to week. Please note that some of these events are for Goat Guardian Guild members only—check the details to find out.